These Synthetic Oils are used for for all types of engine and gear applications, including those for specialized vehicles and severe operating conditions. In addition, AMSOIL has developed sophisticated fuel additives, filtration systems and other companion products that supplement and extend lubricant performance. All are distributed through a worldwide network of independent Dealers. This complete line of quality products is recognized by countless private motorists, fleet managers and industrial administrators as the best and most cost-effective choice for increasing engine performance, reducing maintenance and prolonging vehicle and equipment life. Know the Facts - AMSOIL Saves You Money! AMSOIL extended drain intervals means fewer oil changes, long term savings and convenience. Even if you drive only 12,000 miles per year, the cost for AMSOIL motor oil is less than you pay for petroleum oil now! And you still get better wear protection, lower engine temperatures, improved fuel efficiency and easier cold-weather starts. All of these benefits add up to reduced operating costs and longer engine life. Change your oil and filter today and in 12 months change the oil and filter again. That’s it! What could be more convenient and good for your vehicle, too? 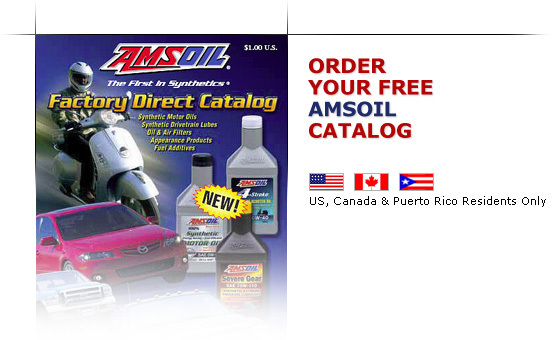 *Note: As of December 1st 2009, leads that contact AMSOIL are no longer being sent their requested information via USPS Mail. Instead, they are being sent PDF files pertaining to their indicated interest at the time they request it. This is an effort to get a prospect their information at the time they are interested, rather than having a delay in waiting for their kit to arrive in the mail.